Santa Claus is comin’ and running to your town! Jingle all the way through the course with cookies and candy, festive music, creative Christmas images, and so much more all designed to get you in the perfect holiday mood. 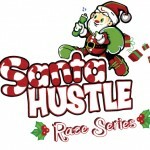 To make your jingle tingle, new to the Santa Hustle this year includes a dri-fit sweatshirt along with a Santa hat and beard.